Today’s fodder for thought was sparked by Charles Spurgeon’s answer to the question, “What is the reason for our troubles?” Spurgeon said there are four reasons that we find in Scripture. First, God uses the furnace of affliction to refine us. “Behold, I have refined you, but not as silver; I have tried you in the furnace of affliction.” (Isaiah 48:10). This is the upward reason for our troubles. Second, as followers of Christ we are enemies of Satan. . . and he assaults us. “Be sober-minded; be watchful. Your adversary the devil prowls around like a roaring lion, seeking someone to devour.” (I Peter 5:8). This is the downward reason for our troubles. Third, because we are strangers and aliens in this world we will face the trials that come with living life on this broken earth. “You adulterous people! Do you not know that friendship with the world is enmity with God? Therefore whoever wishes to be a friend of the world makes himself an enemy of God.” (James 4:4). This is the outward reason for our troubles. And fourth, we battle our own broken and sinful hearts. “The heart is deceitful above all things, and desperately sick; who can understand it?” (Jeremiah 17:9). This is the inward source of our troubles. Spurgeon reminds us that while we must recognize and reckon with these realities, we can’t throw up our hands in despair. The good news is that God promises to be with us and to deliver us. “When he calls to me, I will answer him; I will be with him in trouble; I will rescue him and honor him.” (Psalm 91:15). The cultural narrative is pointing us and our kids into false expectations and beliefs that will influence our desires and behaviors in the wrong direction. Thanks be to God for his Word. Take heart! 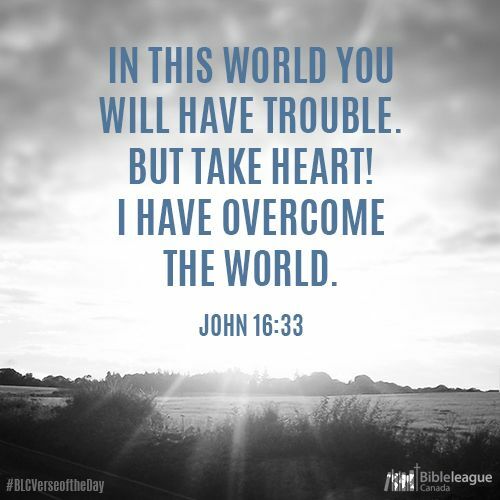 He has overcome the world! Let’s learn it, embrace it, live it, and teach it! ← Youth Ministry’s Crucial Cultural Mission. . .